Hi it’s me, Cindy. I’m writing my own bio for the new record, “Nowhere to Hide,” because… I don’t want to hide behind someone else’s version about what went down. I’ve been at this a long time. But I feel like this cd is the start of a new chapter in my life as an artist. The idea of this record was completely Kirk Pasich’s, founder and President of Blue Élan Records. He wanted to capture the raw, emotional connection of my acoustic performances that he’d been watching on stage for many years. The focus was to be on the artist and the song, and not on production. Nowhere to Hide became a concept – the record was recorded live in single takes, where we played together in the same room. The only instruments involved were voices, a grand piano, acoustic guitars and dobro. Kirk set the stage, and allowed the musicians to do what they do best in an environment without restraints. Kirk was seeking the beauty of imperfection, not a slick production. There was no click track, so the songs ebb and flow with emotion and honesty, and the push and pull of heart strings. There was a lot of love in the room. Everyone involved in this record is a friend, and is special to me. The relationships span the entirety of my career – from my first writing partner/band mate Paul Trudeau to my latest writing partner/producer Colin Devlin. To mix my past and present together in one room was a rare opportunity. Paul and Colin cover most of the tracks instrumentally and vocally, and we sprinkled the collection with appearances by my first producer, mentor and writing partner, Dave Darling, my soul sis and superstar Janiva Magness, my touring sidekick and duo partner Ali Handal, my long time band mate Tina Trevino, my Blue Élan sister Scout Durwood, Randy Ray Mitchell – who I met when I first came on the scene and has played in my band over the years, Bernie Barlowe – who has graced some of my previous records with her gorgeous back up vocals, and a brand new musical collaborator, pianist Tyler Cash. Recorded summer 2017 at Clear Lake Audio and Fever Studios, with owner/ engineer Eric Milos at the helm. I met Eric when I recorded Deep Waters at his studio and felt so strongly about his work ethic and talent, that I insisted he be involved. For the final sonic touches, we turned to Grammy nominated mastering engineer Emily Lazar. The second track, “Passenger” was written on New Year’s Day 2017. I was driving home from my parents’ house in Palm Desert with my kids and started to “zone out” in a stretch of highway with 1000’s of windmills on either side. That area of the freeway is almost hypnotic. I was almost hit by a truck. Jolted out of my daze, I noticed that the side of the truck read “Hurricane Express.” Google them! It’s a real trucking line, “family owned company based in northeastern Oklahoma.” I hope to make them famous 😉 The song was written completely in my head between the windmills and home. “4 Hours” is an old fan favorite from the 2005 release entitled Angels & Demons. I co-wrote it with hit songwriter Kim Tribble out of Nashville. I had just flown to Austin for the SXSW conference and there was a storm above the airport. So we had to circle….for four hours before landing. Let’s just say it was a productive flight. Next up is “Heels Over Head” which originally opened my 2014 release of Curve. This song, co-written with Dave Darling, is me taking responsibility for all of the dysfunctional relationships that pepper the first half of my catalogue. It was my manicurist (cheap therapist) who enlightened me: These guys were not “unavailable.” It was ME who was “unavailable” for a healthy relationship because I chose inappropriate partners. Then I met my husband on match.com. The End. Just kidding. I found inspiration in other aspects of my life. But I did meet my husband on match.com. “Something to Look Back On” is a brilliant tune written by my friend and label mate, Janey Street and award winning, hit songwriter Gary Burr. Kirk sent me the song the evening before our recording session and asked me what I thought about covering it. The first time I heard it, I cried. It was these words: “When the sky on my horizon is more sunset than dawn…” As a cancer survivor, this cut me to the core. Paul, Colin and I worked up an arrangement the next morning and this is our first take. “Everything I Own” When I committed to making this record, I asked my fans on social media to suggest some of their favorite songs for me to cover and this David Gates/ Bread classic was one of their suggestions. I’ve always loved this song, and also truly value the involvement and feedback of the people who make my career possible – my fans. “Soul Quake” Kirk has always believed in this song and this was one that he was adamant about including. It is from my 2012 release Every Rise and Fall, which focuses on my reclaiming my identity and finding new inspiration after getting married and having children. I wrote this song it for my twin daughters when they were in the womb! When I found out I was having two girls, I burst into tears. Not because I wanted a boy…but because I worried about the following scenario: WHAT IF they fall in love with the same guy? The could break each other’s hearts! I’m not sure that either of them has had a soul quake yet, but I sure have. A soul quake can be anything that shatters us in the moment, but we emerge stronger and more enlightened because of it. “The Song Will Always Find You” Sometimes, I write a song to work through pain. This is an example of music as a net that catches all those feelings I can’t express elsewhere. The song is a way to reach someone that won’t hear me otherwise. It’s also a way to put my truth out there, in a form that will outlive my physical presence on earth. “Idiot Child” was written with Paul Trudeau circa 2001 and is included on the 2003 release Smash. It was originally Paul’s song until I flipped out over the title and the chorus melody, and then reworked it for myself. We both came to the conclusion at that point in our lives, that sometimes life is easier the less you know. It was a feisty, angsty, and rebellious period for me – and this song became a staple in my live set. “Book of Love” I learned this song at the request of my dear friends Don and Joelle Adkins, who have hosted me many times at Studio 519, my favorite House Concert venue. I fell in love with this song and am so happy to include it on my record and dedicate to them. I always thought it was a Peter Gabriel composition (and I love his version), but was delighted to discover the prolific songwriter behind it: Stephin Merritt. Born and raised in Los Angeles, Cindy was trained at the acclaimed USC School of Drama but realized quickly that there was enough “drama” in real life and the best part she could play… was herself. So, she wrote what is now 9 cd’s (and added to numerous compilations and soundtracks) worth of her life, which she has performed all across the United States, Japan, Germany, Ireland, and islands as far as Barbados and Guantanamo Bay. Music has always been the key to her adventure, and she soaks up the stories of those she meets, the cultures, the geography, the spirit and the down and dirty details of the road she travels. As a seasoned writer and performer, she has tackled numerous subjects – not only the classic singer/songwriter confessional fare of dysfunctional relationships, marriage, and motherhood, but also her personal discovery and recovery from breast cancer, the perils of the entertainment business, classic literature, sexuality, spirituality, history and the human condition. There is no topic which is out of bounds – she tells The Truth. “P-nut,” as she is affectionately known by her fans, has a voice that defies her petite stature. Classically trained, this coloratura soprano hits the high notes like an angel but also bellows with rich, velvety tones in the lower half of her over three octave range. She’s a storyteller, and her show benefits from the stories, humor and banter with the audience in between songs as it is does from the music and exceptional execution. Cindy Alexander CONNECTS, and her relationship with her fans has funded her recording projects and fueled her continued success as a touring indie musician. She’s won a multitude of awards including David Foster’s/NBC Star Tomorrow, L.A. Music Awards Songwriter of the Year/ Independent Pop Album of the Year/ Producer’s Honors – Best of Last 25 Years Female Singer-Songwriters, All Access Magazine’s Best Female Pop Vocalist, Just Plain Folks Song of the Year/Female Artist of the Year, L.A. Music Critic’s Best Female CD (3 time winner) and Best Pop/Rock Artist. Even with accolades and a “record deal” as a prize for winning a reality show, she’s stayed independent on her own JamCat Records, which found the perfect partner in Blue Élan Records in ‘14. Cindy has shared the stage with John Hiatt, Bacon Brothers, America, Suzanne Vega, Joan Osborn, Rick Springfield, Beth Hart, Everclear, The Bangles, Edwin McCain, Marc Cohn, etc. and has appeared on compilation cd’s along side Sarah McLachlan (Chilled Sirens- Water Music Records), Aimee Mann (Eclectic Cafe – Water Music Records) and Norah Jones (Sunday Brunch – Treadstone Records). She has also appeared on soundtracks: Sugar & Spice (Trauma Records) and has been featured in films (Here on Earth, Smokers, Sugar & Spice, Dorm Daze II, People I’ve Slept With, My Trip Back to the Dark Side etc.) and TV (Party of 5, Chasing Farrah, So You Think You Can Dance, VH1/MTV). 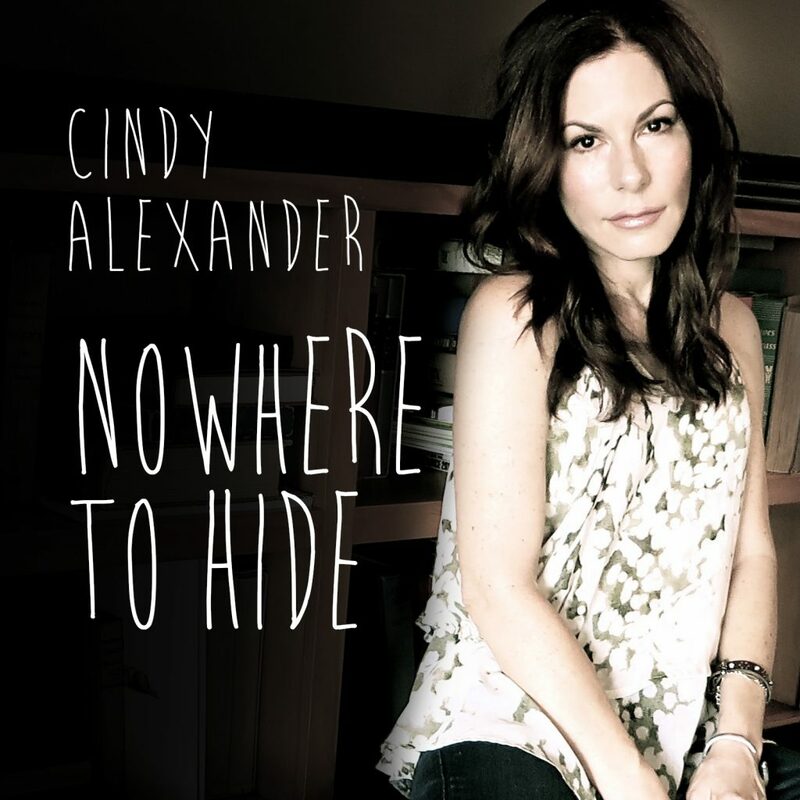 Aside from being a singer/songwriter/ recording artist, Cindy Alexander is a wife, daughter, friend, mother of twins, breast cancer survivor, advocate and Ambassador to BreastCancer.org, animal rescuer, avid reader, hiker, cribbage competitor, baker of OCD chocolate chip cookies, volunteer, and guacamole lover.